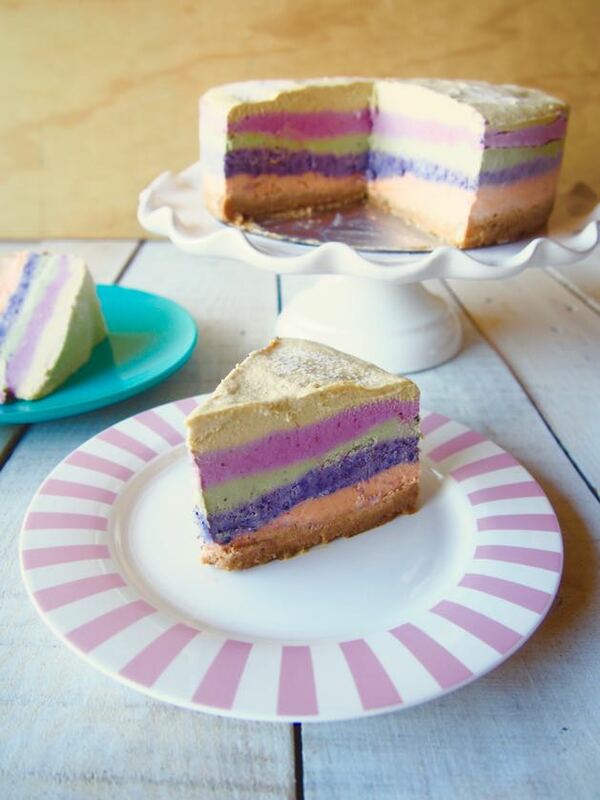 How pretty is our Raw Vegan Rainbow Cake? Um. Yes. It’s amazing. It’s pretty and it’s oh so delicious. We got all our fresh fruit from our local Supabarn (we really do love Supabarn AKA local, epic grocery store). 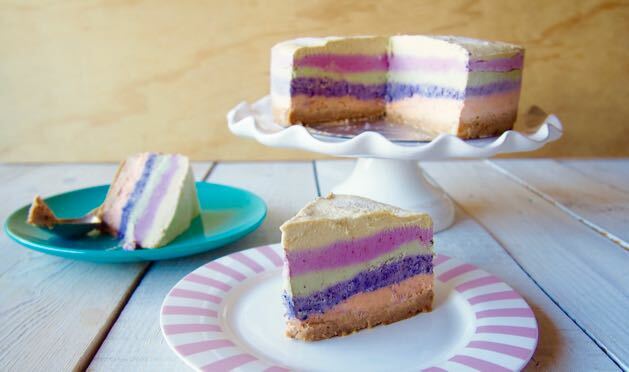 There’s a whole bunch of layers to this cake and you seriously have to whack this on your ‘to make’ list right. THIS. SECOND! We reckon that this is the perfect cake to celebrate the start of 2016! Hooray! Happy 2016! We love new years. New weeks. New days. New hair. New recipes. New beginnings! 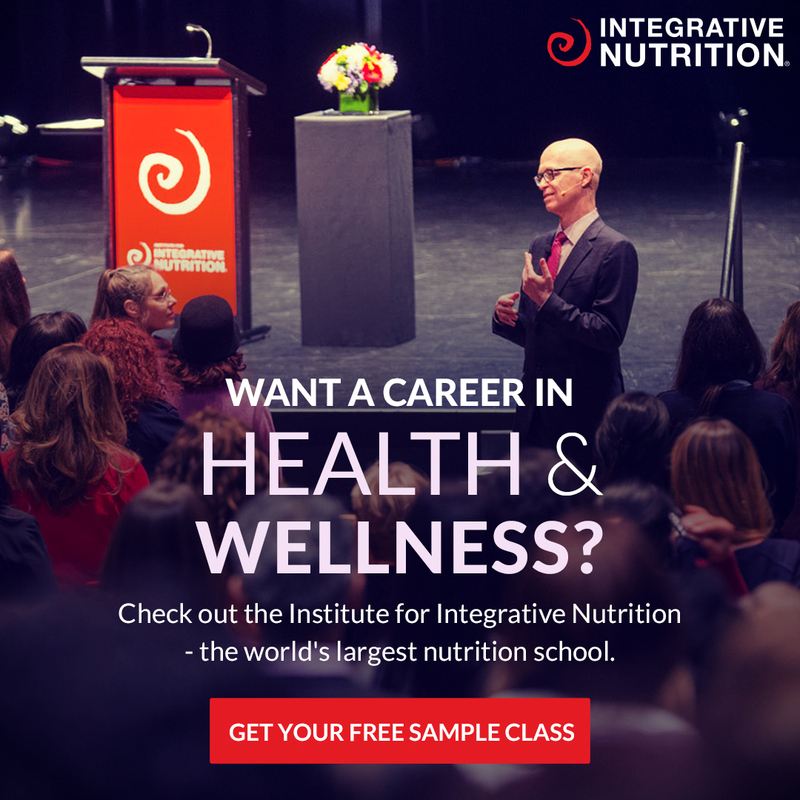 How can you make 2016 the best year of your life so far? Have a think for 2 minutes and write it down… heck, if you wanna share it, post a comment on this blog post! We’d love to read all about your plans for best year evers. 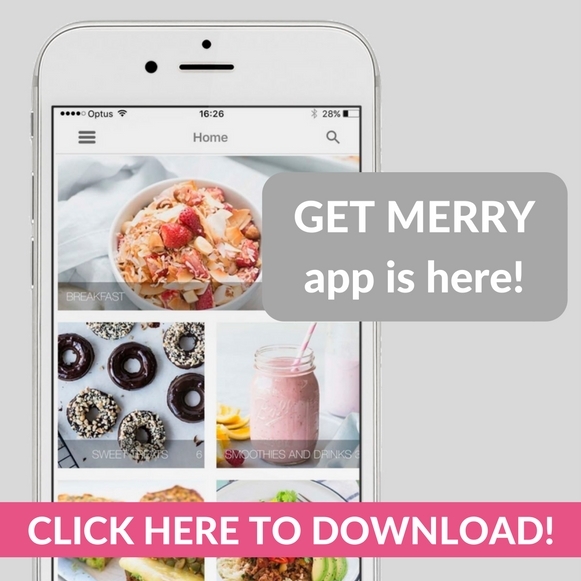 Our plan to create the best year ever is to host EPIC Make Life Merry Challenges (you should join our January challenge because that would be oh so fun if you were there… it starts SOON! ), move to the ocean, travel often and laugh a heck of a lot! Sound good? Yep. Sounds AHHH-freaking-mazing! Plus, this Raw Vegan Rainbow Cake being part of our 2016 pretty much means that it’s already the best year that there ever was. 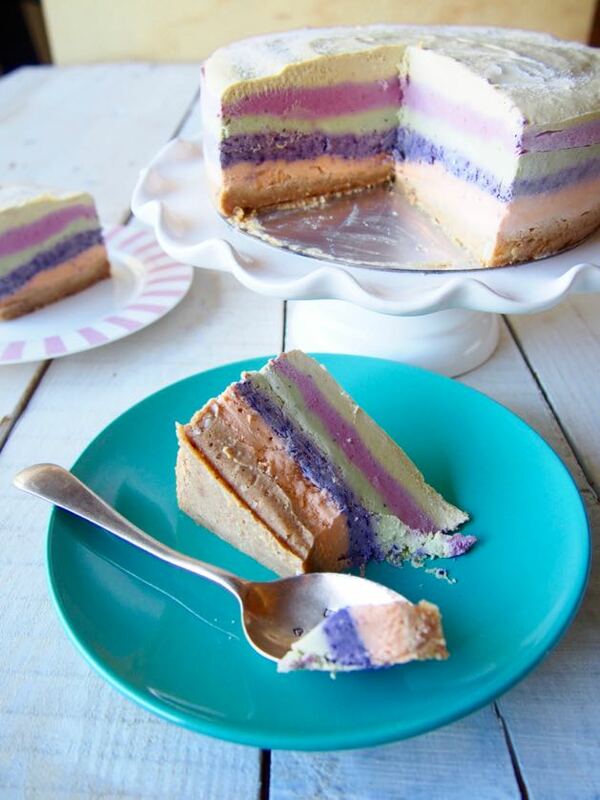 It’s like magic, fairy, unicorn, rainbow cake. p.s reminding you all… this is a treat and high in fructose. Not for everyday 😛 just special somedays! Start with the base, place all the ingredients into a blender or food processor and whiz until nice and smooth. Transfer into the prepared cake tin and press the base down, making sure you press it out evenly, covering the entire base. Now to start with the filling. Drain and rinse the cashews and place them into a food processor or blender along with the coconut milk, coconut oil and vanilla, whiz until smooth. Add the rice malt syrup to the blender and whiz slowly on low speed until combined. Pour out 4 cups of the mixture into a bowl. You should be left with about a cup of mixture in the blender. Add the chopped papaya into the blender, whiz until nice and smooth. Pour on top of the base, smooth out the top and place into the freezer for 2-5 minutes. Don't worry about rinsing the blender and transfer 1 cup of mixture into the blender, along with the blueberries. Whiz till smooth. Pour blueberry mix on top of papaya mix, smooth out the top and place into the freezer for 2-5 minutes. Rinse the blender and add 1 cup of filling mixture into the blender along with chopped kiwi fruit and matcha powder. Whiz until smooth. Pour kiwi mix on top of blueberry mix, smooth out the top and place into the freezer for 2-5 minutes. Don't worry about rinsing the blender, add 1 cup of filling mixture along with the raspberries into the blender. Whiz until smooth. Pour raspberry mix on top of kiwi mix, smooth out the top and place into the freezer for 2-5 minutes. Rinse the blender for this layer and add the rest (about 1 cup) of the filling mixture along with the mango into the blender. Whiz until smooth. Pour mango mix on top of raspberry mix, smooth out the top and place into the freezer for 2 hours. Take out of the freezer, cut in to slices with a hot knife and enjoy! Store leftovers in the freezer and thaw out as required! YUM and oh so pretty! Don't wanna do all the layers? Pick your fave colour, add extra fruit and just do one layer! 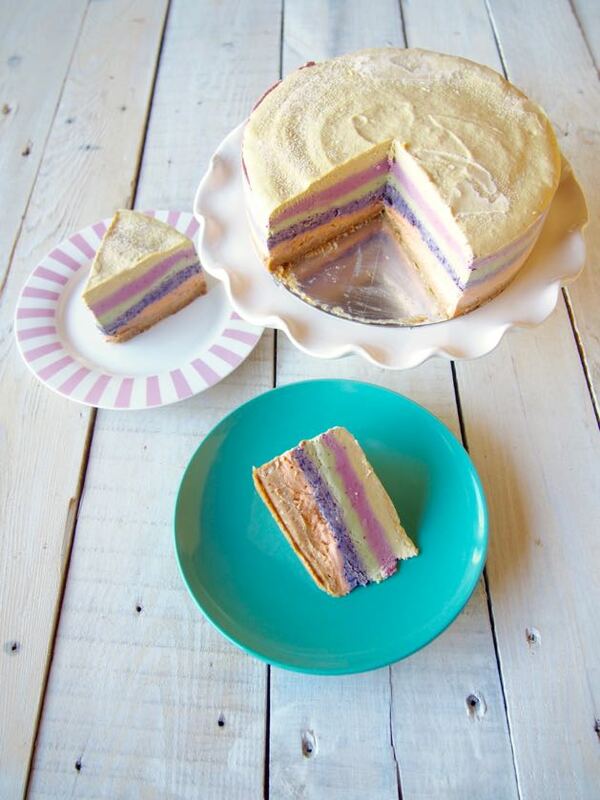 Thanks to Supabarn for supplying all the ingredients for this DELICIOUS Paleo Raw Vegan Rainbow Cake! Read more about how we work with brands HERE!